There is only one pizzeria, that can claim the the title as The Best Pizza in Las Vegas and that is Metro Pizza. Metro has been on the radar of Pizza Therapy for a number of years. And with good reason. They make their pizza with heart and excellence. The Metro team loves pizza. They live pizza. They are passionate about pizza. 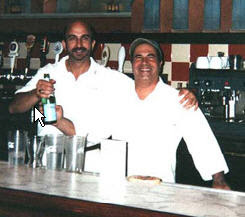 John Arena and his cousin Sam Facchini founded Metro in 1980. They have not looked back since. The true love for the art form of pizza shines through with John and Sam's mission statement about Metro. "We believe that a true Pizzeria should be a gathering place for family and friends to relax, share great food and enjoy each other's company. We have visited hundreds of Pizzerias across the country, learning and gathering recipes to bring our guests a taste of home, wherever home might be." There are so many amazing things about Metro Pizza that it would take an entire book to list them. John and Sam take the entire Metro team to visit and learn from Chris Bianco, legendary owner of Pizzeria Bianco in Phoenix, Arizona. Sam and John learned to make pizza from their family in New York and have carried on the tradition. They have a wall with picutres of the Best Pizza in the USA. If you bring in a picture of yourself outside a great pizzeria, they will give you a heavy discount on your pizza order. If you come in and request a certain stlye of pizza: they will try to replicate it for you. John and Sam are on a perpetual pizza quest to find great pizza: they regularly take trips around the country to sample the best of the best pizza. They take that knowledge and impart it into their own pizzas. The interview is very explicit as you will discover things about pizza you never realized. You will also discover that John Arena is not only a pizza master but a great person. He is knowledgeable and takes his pizza seriously. So next time you are in Las Vegas, stop by Metro and tell them Pizza Therapy sent you. Pizza Tools for great pizza! Thanks very much Angelina. We are totally honored that we made the list. Thanks so much. pizza on earth, good will to The Daily Reviewer!